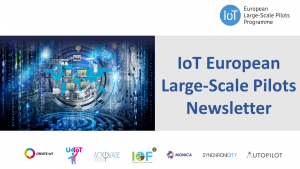 The IoT European Large-Scale Pilots Newsletter is coming soon, subscribe now! The IoT European Large-Scale Pilots Programme Newsletter is coming soon! Do you want to stay up-to-date on our initiatives? Are you interested in receiving updates from the Pilots use-cases, video interviews and infrographics with fresh data on our IoT Focus Areas? Do not miss the chance to get the latest news on the achievements of the LSP projects, interesting upcoming events in the field of IoT and much more. Join the IoT community!